This worksheet generator uses five drop-down menus of sight words and displays the corresponding pictures. On the right, the letters of the words are scrambled and correspond with the pictures. First unscramble the words and then write the word on the line below. 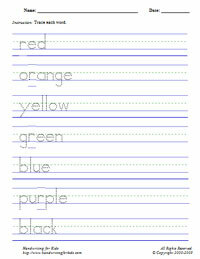 The generated worksheet can be used to practice either Manuscript or Cursive handwriting. See example worksheet on the right. This worksheet generator uses five drop-down menus of sight words and displays the corresponding pictures. On the right, the words are scrambled and they are out of sequence with the pictures. First unscramble the words and then write the word on the line below. Draw a line to match the picture and the word. 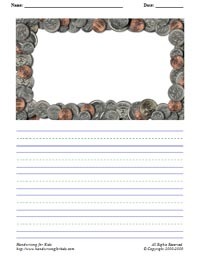 The generated worksheet can be used to practice either Manuscript or Cursive handwriting. See example worksheet on the right. Make Your Own Pictures/Vocabulary Words - NEW! This worksheet generator uses six drop-down menus of pictures and the corresponding sight words on a worksheet. See example sheet on the right. Make Your Own Traceable / Copywork Vocabulary Words - NEW! Enter your own words, it will create a traceable/copywork of words on a worksheet. See example sheet on the right.